VPS Malaysia Review 2019: Is VPS Malaysia a Good Hosting? Full-service host VPS Malaysia sells shared hosting, VPS, and dedicated servers with SSD storage and a 99.9% uptime SLA. The prices are premium, but the support is superb. VPS Malaysia was founded in 2012, so it’s a relatively new entrant to the hosting industry. Despite its name, this vendor sells more than VPS hosting; it also sells shared hosting and dedicated server packages. VPS Malaysia has worked with more than 50,000 customers, and its website and support are both available in English. VPS Malaysia co-locates its servers in the CX2 data center in Cyberjaya, Malaysia. While this vendor doesn’t actually own the data center, it does guarantee 99.9% uptime with credits for excessive downtime. Servers use SSD (up to ten times faster than traditional HDD) in RAID 10 configuration, to safeguard data in the event of a disk failure. 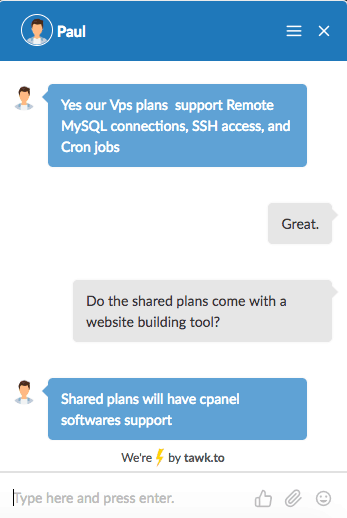 And all the shared hosting plans use CloudLinux to isolate you from other hosted customers. Shared hosting plans come with the cPanel control panel and the Softaculous one-click installer for more than 400 programs. Unfortunately for beginner webmasters, there is no website building tool, but more advanced customers get support for PHP, MySQL databases, and (according to the live chat operator) all popular programming languages. VPS Malaysia’s prices are quite high but do take into account that a domain name is included (for annual plans) and an SSL certificate is included, so there are minimal additional costs apart from backups that come at extra cost. The resource allocations are high, with the ‘Starter’ package including 10 GB disk space and unlimited bandwidth. The only caveat is that you’re only allowed to host one domain. Hosting plans can be bought on terms ranging from one month to three years, with more than 50% discount (plus a free domain name) for committing to more than a year. To help you support yourself, this vendor has provided a useful FAQs page and a series of blog tutorials. As a relative newcomer, VPS Malaysia is not one of the leading Malaysian hosting brands. You’ll pay a premium for the plans, plus extra for backups, but this is SSD-based hosting with a solid 99.9% uptime SLA, the Softaculous installer, and excellent customer service. Wondering how VPS Malaysia stacks up against other Web Hosting companies? Enter any other Web Hosting company and we will give you a side-by-side comparison.